Scheduling an interview with Avi Behar, chief executive and broker of Behar Group Realty Group, can be a bit challenging. It might be better to let the younger Behar explain: “I really try to live my life as one whole. So that involves everything that I enjoy doing. For commercial real estate, I was just recently down in Las Vegas for the ICSC shopping centre convention. The blending of the professional and personal makes for a challenging “business or pleasure” answer at customs, he noted. “I’m always inclined to check all the boxes, but I don’t. Whether I go to New York or Paris or L.A. (or studying mixed-use development in Tokyo), I try to always meet with new people including architects and developers and people in the finance industry and really get a sense for the landscape in those regions, but also talk about potential opportunity here. Behar’s eclectic take on the real estate business and life in general is mirrored by the services offered by the Behar Group. The Toronto-based company’s “core business” remains its real estate brokerage, but it is much more than that, explained Behar. “I see our office as really a business office where commercial real estate brokerage is our core business, but we get involved in all types of businesses, some technology start-ups, advisory, equity, etc.,” he said. Behar’s website lists myriad services under four main categories: tenant and landlord services, corporate real estate advisory and technology. The project is not without its problems Behar noted when speaking at the Canadian Apartment Symposium Series. Behar Group also brokered the deal for the land where Liberty Development built Metropolis at Metro Place. At the corner of Sheppard and the Allen Expressway across from Downsview Park, it is a million-square-foot-plus development at the top of the city. Behar Group has morphed from a one-person brokerage father Yosi ran out his house to a two- or three-person company (counting) Avi’s mom in the early days, to a 27-person brokerage since the younger Behar got his start in the business 25 years ago. One such group Behar actively works with is 3 Brewers, which operates restaurant breweries in Quebec as well as Ottawa and Toronto. The company is also working on an expansion with Dave & Buster’s. The arcade game and sports-based restaurant chain has 75 locations in the U.S. and one in Vaughan, Ont. 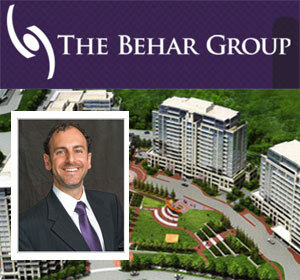 It’s safe to say that as long as Avi Behar is working, he and his firm will continue to learn and innovate. “Just in general, we are working to get new ideas . . . whether it is from retailers or architects or designers or mortgage professionals or developers from around the world. So wherever I go, I really try to meet people and absorb, learn about other cultures. “We have a lot to learn here,” he said in reference to Tokyo’s version of the below- and above-grade mixed-used PATH system.